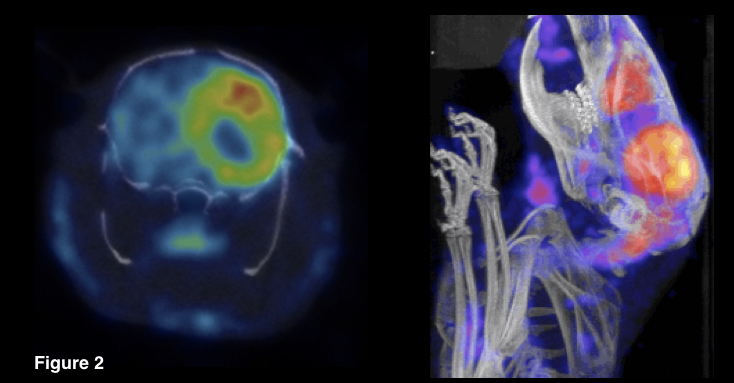 18F-FDG PET imaging is frequently used in preclinical oncology, cardiology, infection & inflammation and neurology studies. It has been demonstrated that the dietary state, ambient temperature or muscle activity might influence 18F-FDG uptake in normal tissues in laboratory animals and human (1, 2, 3). As a consequence, these differences in animal handling can influence 18F-FDG uptake in the tissue of interest (e.g. brain, tumor, etc.). Therefore, it is important to assess the animal handling protocol during study set up and to select the most suitable handling protocol. This application note gives an overview of the different animal handling protocols and their outcomes (4). All animal handling was approved by the local ethical committee at Ghent University. The study conditions are summarized in Table 1. For all fasting conditions, mice were fasted for 8-12h. Mice had access to drinking water ad libitum. Warming of the animals was done using an infrared lamp and was started at least 30 minutes before injection, and was continued during the uptake period. 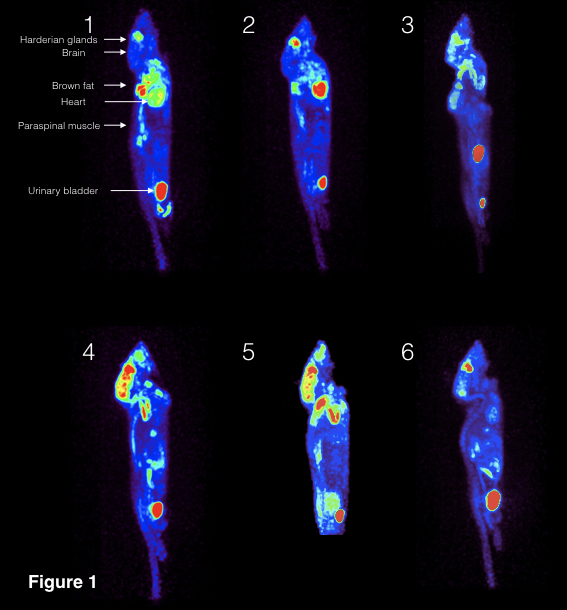 µPET imaging was performed on the B-CUBE. Mice were intravenously injected with approximately 50 µCi (1.85 Mbq) 18F-FDG and were imaged 30 minutes post injection. A whole-body PET acquisition of 10 minutes was done. During all acquisitions, the mice were kept under isoflurane anesthesia. The PET data were iteratively reconstructed by OSEM using, 50 iterations, with a reconstructed voxel size of 400 µm. Figure 1 shows sagittal slices of 18F-FDG uptake in the different conditions. In condition 1 (reference, no fasting, warming or anesthesia during uptake) the highest uptake was observed in the brown fat, Harderian glands, skeletal muscle and myocardium. Warming of the animals (condition 2) resulted in reduced brown fat uptake. Fasting (condition 3) reduced 18F-FDG uptake in the muscle and brown fat. Combined fasting and warming (condition 4) resulted in reduced 18F-FDG uptake in brown fat and increased brain uptake. When the injection was done in conscious mice (condition 5), the effect of fasting and warming on skeletal muscle was offset. In mice that were anesthetized during the uptake period (condition 6), reduced brain uptake was observed. Figure 2 shows an example of a rat with a brain tumor. In this example, the aim is to assess 18F-FDG uptake in the tumor. Therefore, the tumor to background (brain) ratio should be as high as possible. Additionally, the uptake in other tissues should be as low as possible. As a result, we opted for condition 6. 90 minutes post injection, a 10 min PET acquisition was performed with the brain in the center field of view. In conclusion, the animal handling protocol influences the 18F-FDG uptake in rodents. Therefore, it is important to evaluate the animal handling protocol during study set up. Aim: maximal brain uptake: condition 4 and 5. However, condition 5 will cause more stress. Fueger BJ, et al. J Nucl Med 2006;47:999-1006. Lindholm P, et al. J Nucl Med 1993;34:1-6. Schelbert HR, et al. J Nucl Med 1998;39:1302-1305. Kutner & Stout. Frontiers in Physics 2014;2:1-11.